The Gene Simmons biography is the story of a musician who excels in business as much as he does on the stage. Although he is the front man of one of rock's most successful and longest-lasting bands, Simmons always approached his band as a business and has used the fame of his band to expand his off-stage business dealings. Though fans know him best as Gene or The Demon, Simmons was actually born Chaim Witz. Witz started his life in Tirat Carmel, Haifa, Israel, on August 25, 1949. At age eight, Witz moved with his mother - a Holocaust survivor - to the Jackson Heights section of Queens, New York. There, he adopted the name Eugene Klein. 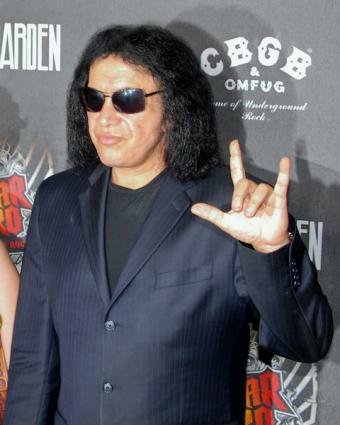 Another name change came in the late 60s, when Simmons legally changed his name to Gene Simmons, a moniker borrowed from his favorite rockabilly musician Jumpin' Gene Simmons. During his teen years, Simmons became involved in a series of bands. First, he started Lynx, which later became The Missing Links. After playing with that band for awhile, Simmons left and formed the Long Island Sounds. That band played the local circuit for a few years, until Simmons enrolled in Sullivan County Community College, where he formed a new band, Bullfrog Bheer. During this period, Simmons was also very active in writing for science fiction fanzines. His writing during this period became the inspiration for much of KISS' stage show and personas later. In the early 1970s, Simmons had a fateful meeting with local guitar player Stanley Harvey Eisen - later known as Paul Stanley. The two formed a musical partnership that would change Simmons' life. Simmons and Stanley started working together as musicians in a band they co-founded called Wicked Lester. Wicked Lester recorded one album together, but it was never released, as Simmons and Stanley were disappointed in its quality. Despite the struggle with the first album, Wicked Lester landed a deal with Epic Records. Simmons and Stanley became increasingly convinced that the problem with Wicked Lester was the look of the bandmates. When the other band members resisted the idea of makeovers, Simmons and Stanley tried to fire them. Epic Records stepped in and tried to block the firings, so Simmons and Stanley decided to leave Wicked Lester, giving up their record deal. With the help of Stanley, Simmons decided to form what they called "the ultimate rock band." They decided from the very beginning that they wanted their band to not only play good music, but to also essentially be a marketing machine. Their first step was finding a drummer, and eventually settled on local Brooklyn musician Peter Criscoula, who later became known as Peter Criss. KISS was born. They began playing as a trio while they advertised for a lead guitarist in The Village Voice. Paul "Ace" Frehley responded to that ad and got the job. Simmons and Stanley worked very hard to develop KISS' signature blend of metal and glam rock, as well as the make-up and stage personas for all of the band members. The group landed a record deal and became one of the 1970s biggest-selling bands. Onstage, Stanley took the role of lead showman, but it was Simmons who worked behind the scene to develop the band's massive merchandising empire. Thanks to a rabid fan base - known as the KISS Army - that was fostered by nearly constant touring, KISS was able to create a merchandising business that was significantly more profitable than the band's album sales. With Simmons at the helm, the band developed everything from the traditional t-shirts and stickers to KISS branded coffins. Despite line-up changes over the years, Simmons and Stanley have remained constant partners in KISS, and the band has been touring for over 30 years. Simmons has also launched a TV career, appearing on his own reality show on the A&E Network, called Gene Simmons Family Jewels, and on Celebrity Apprentice. The best place to keep up with new developments in the Gene Simmons biography is his official website.